In Britain, Saw-wort is now confined to localised colonies in the south west of England and Wales. It is not found in Ireland. Saw-worts - there are several species, all very similar - are members of the daisy family. You will find these perennial mid-summer flowers on cliff tops, beside woods and occasionally in woodland glades. 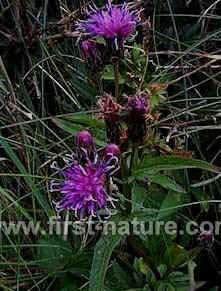 If you walk along the coastal paths of West Wales you will see plenty of saw-wort, generally growing to a height of 20 cm; in sheltered inland areas it grows to twice that height. The flower heads are usually 15 to 25 cm across. The saw-wort in this picture was found on the Pembrokeshire Coastal path near Ceibwr Bay, just south of the Teifi Estuary in West Wales.